The Super Lawyers publication has selected 12 Panish Shea & Boyle LLP attorneys — Brian Panish, Kevin Boyle, Adam Shea, Rahul Ravipudi, Peter Polos, Deborah Chang, Daniel Dunbar, Candice Klein, Spencer Lucas, Lyssa Roberts, Tom Schultz and Paul Traina (not pictured) — as 2019 Southern California Super Lawyers. The annual list recognizes outstanding lawyers who have attained a high-degree of peer recognition and professional achievement. 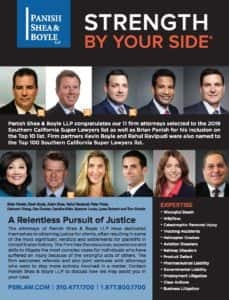 Brian Panish, Kevin Boyle and Rahul Ravipudi were also named among the Top 100 Southern California Super Lawyers. Mr. Panish also named among the Top 10 Southern California Super Lawyers. The 2019 Super Lawyers list represents fewer than five percent of the lawyers in the Southern California region.